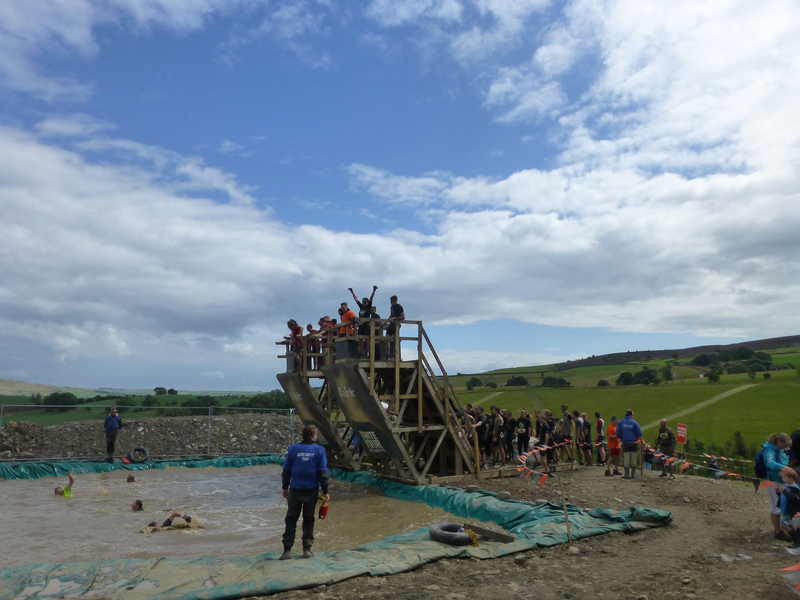 Imagine running an 11-mile course up and down steep hills with over twenty obstacle involving freezing cold water, sheer inclines, half a ton of mud, a 12 foot drop into a pond and electric shocks to finish off. 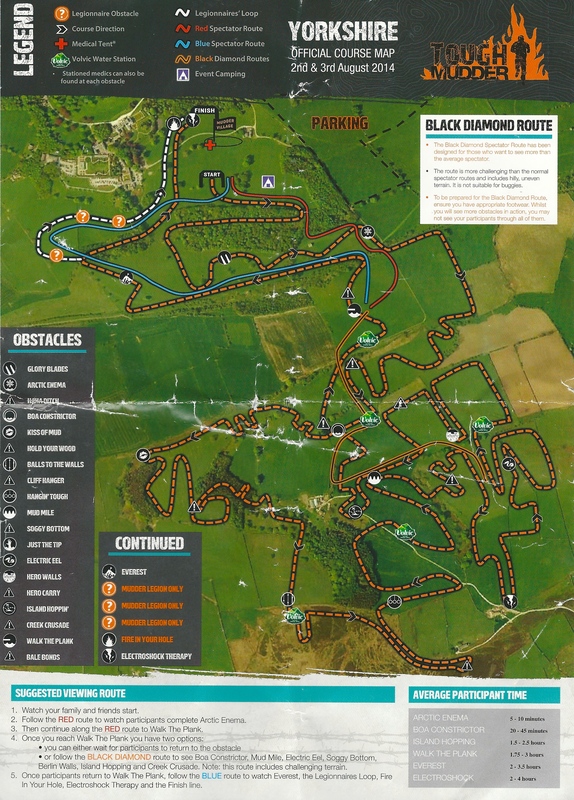 That’s Tough Mudder and I went to watch the one held at Broughton Hall outside Skipton in Yorkshire this weekend supporting a team from Quality for Life Fitness. 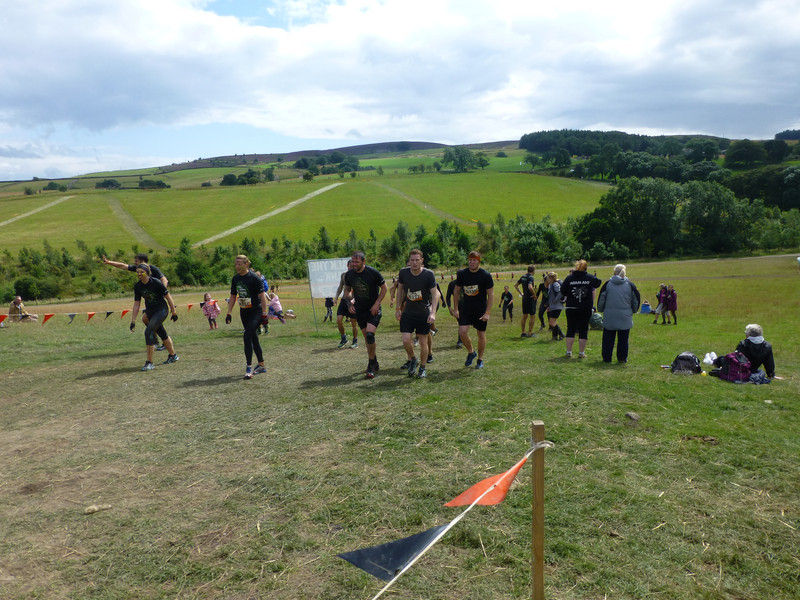 The 18-strong team had been training for months building up their endurance and were in good spirits although a little bit of nervousness was reported among some of the team (performance anxiety?). Once in we watched with anticipation the warm-up sessions before the staggered starts. Most participants seemed to be in teams although there were some solo runners. 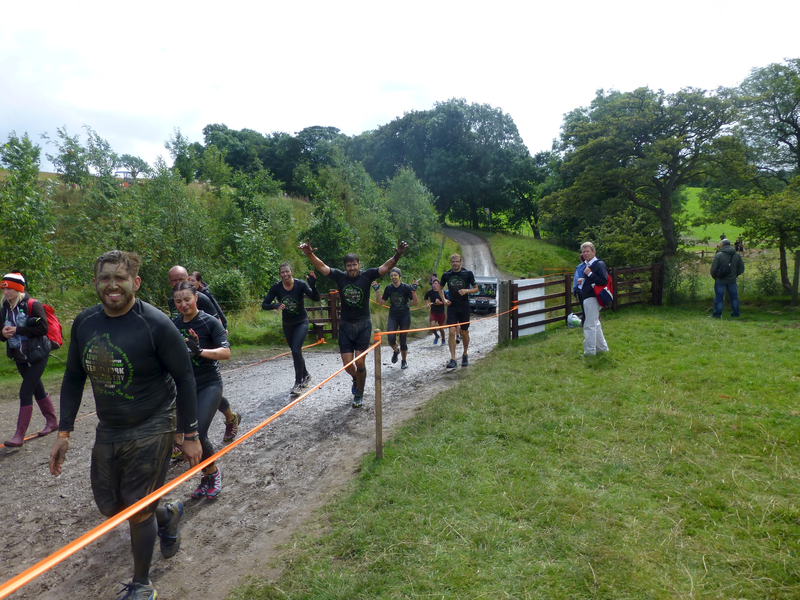 Many seemed to have done it before (and there was an extra loop of obstacles for the veterans). The QFL team started off at 1020. 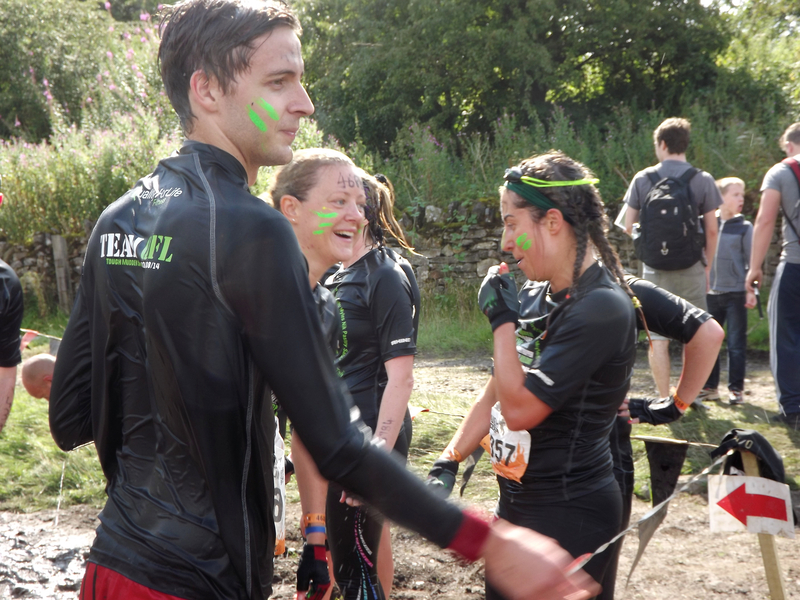 I managed to get to the first couple of obstacles ahead of them and saw them having to submerge themselves in freezing water – “the arctic enema“. 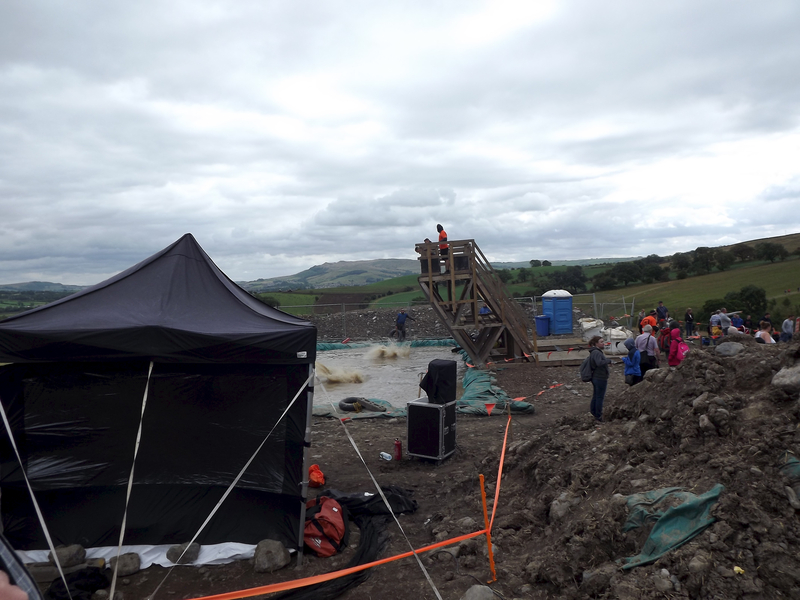 Then we trekked up the hill to “Walk the plank” a 12 foot drop into a deep pond. 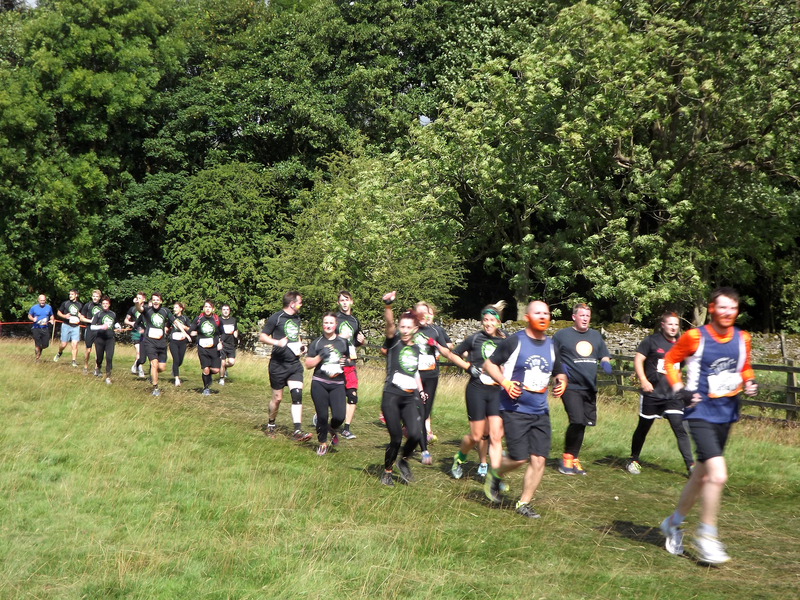 Walking up the steep hills was a challenge in itself (I only noticed on the programme later that it mentioned “challenging terrain”). We split up at that point my partner heading off to the next vantage point way across the valley. When she got back after watching them navigate more obstacles she decided to stay at the Walk the Plank to wait for their return there. I headed back towards the finishing post to catch them on their final run-in and get some food from the various food vendors. 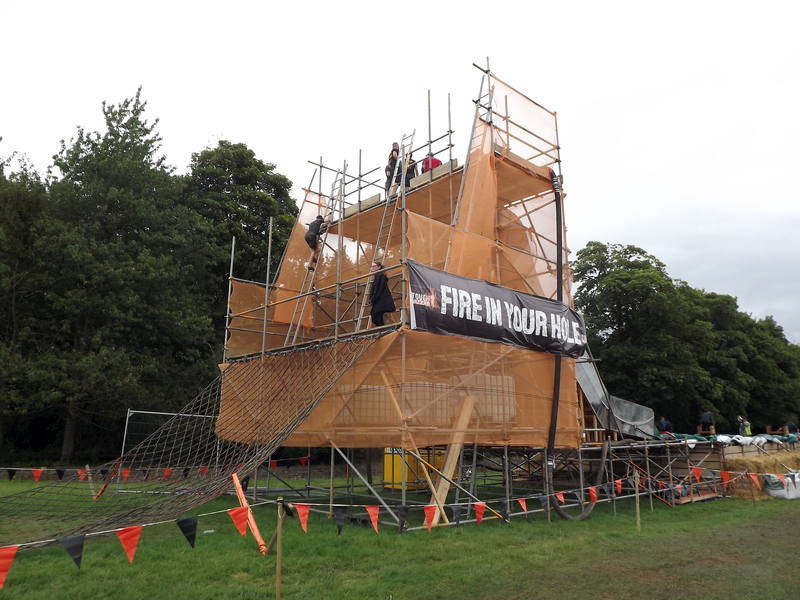 There were extra events for people who had previously completed the event including the “Fire in the Hole”. 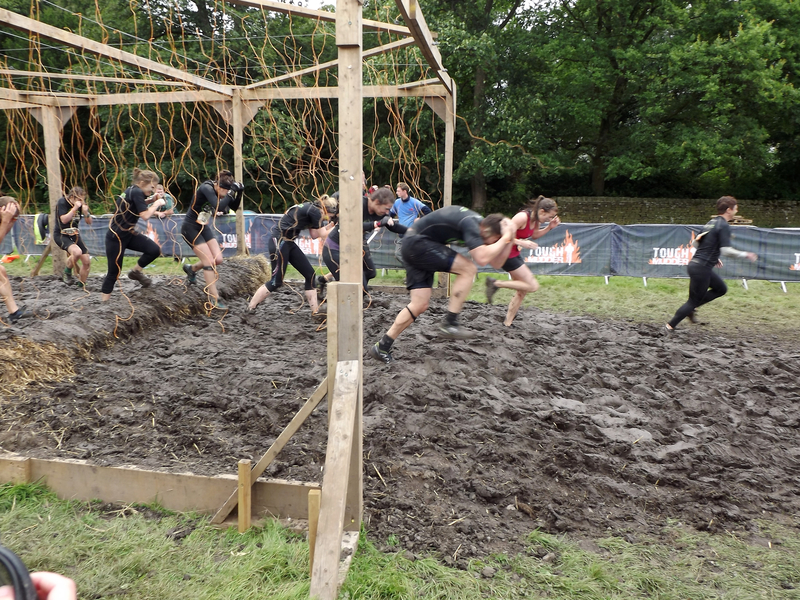 However the last event for the majority of participants was the “electro-shock therapy” running through mud with electric wires dangling down over you. 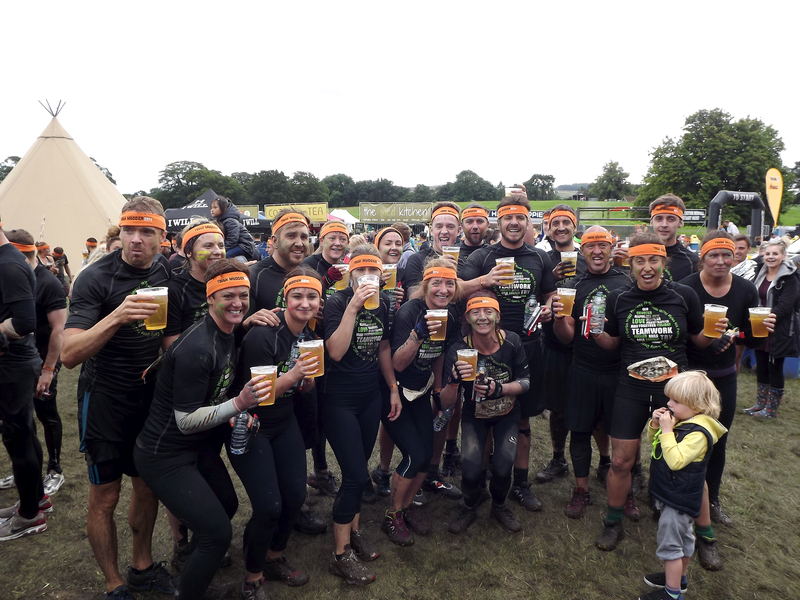 All 18 members of the team made it back together and were absolutely delighted to have completed it and collect their rewards (a headband and a “I completed Tough Mudder” t-shirt). 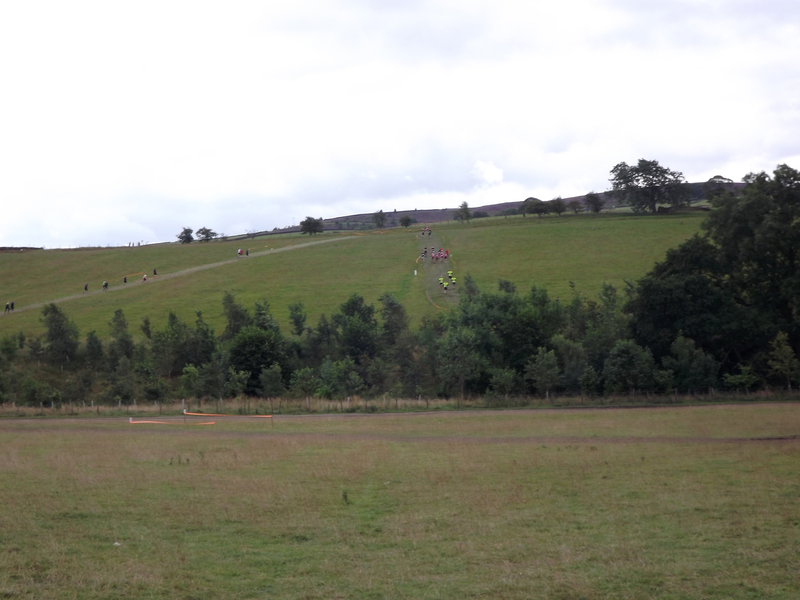 By this time my feet were hurting from all the hiking and having nowhere to sit en route (one thing I would criticise the organisers for) but it must have been far worse for the participants. 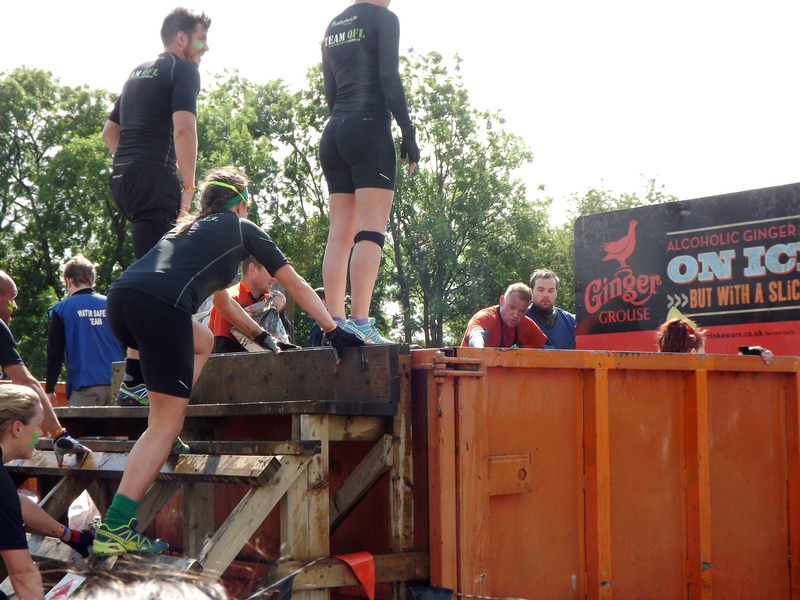 Think your worst cross-country run/fell running interrupted by diabolical obstacles – and that’s Tough Mudder! 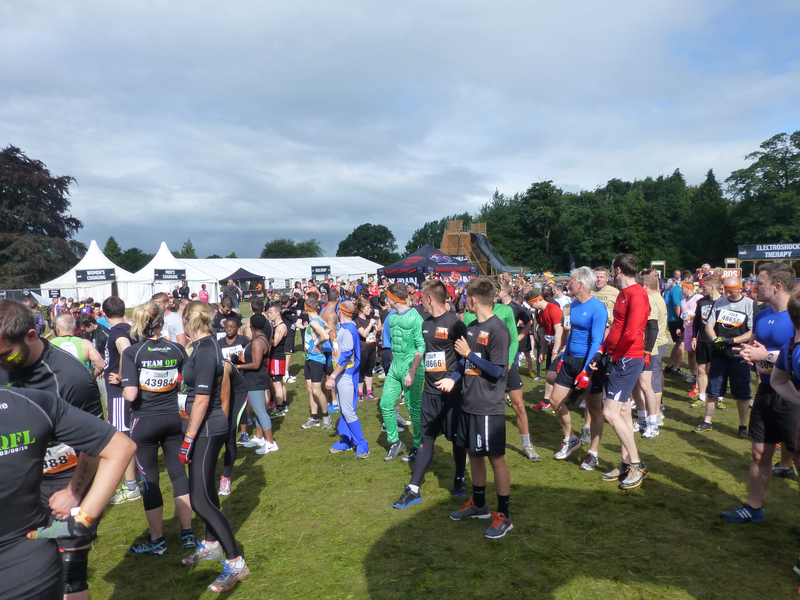 There were several thousand people there, it was well-organised but not cheap (£80 per person to enter at the early-bird rate, £10 for spectators plus £10 to park, plus the cost of team t-shirts, new running gear etc). But at the end everyone who completed it was over the moon with many planning the next one. Congratulations to all the participants especially the QFL team! 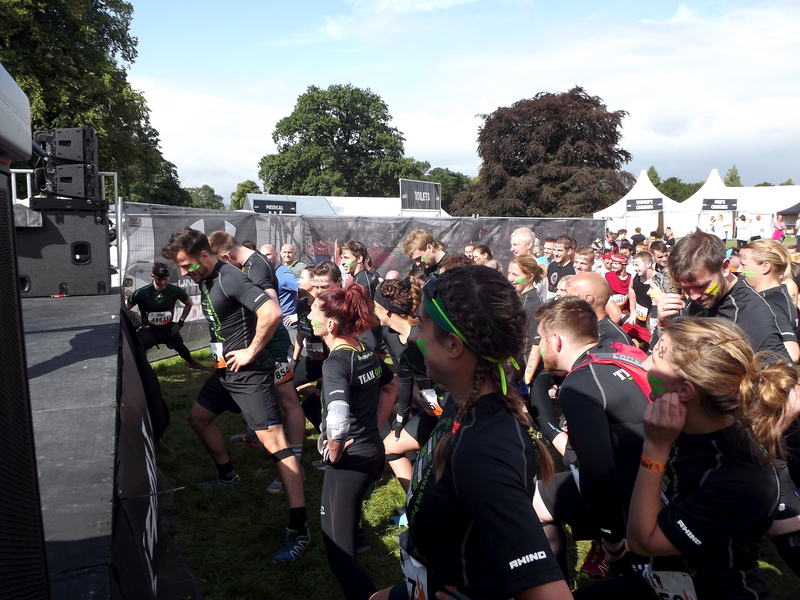 This entry was posted in Health, Lifestyle and tagged Broughton Hall, Quality for Life Fitness, Skipton, Tough Mudder, Yorkshire. Didnt the Vietcong use this kind of treatment on captured prisoners? But good article and excellent range of photographs that illustrate the “challenge” of the course………I will stick to drinking wine. Thanks, I wish I could have kept up with them to se some of the other obstacles like floating stepping stones and tunnels.